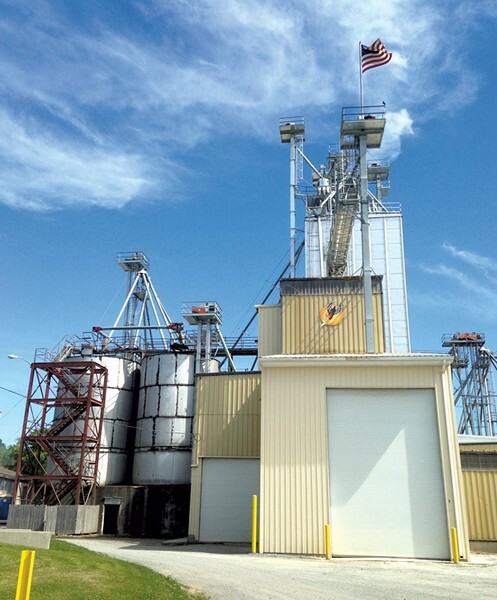 What Goes On at the Phoenix Feed Mill? I've lived half my life in agricultural states and driven past more grain silos and fertilizer plants than I care to remember. Still, I've always wondered about the facility at the intersection of routes 7 and 17 in New Haven Junction. Its conical silver silos tower above the landscape like a giant Erector set. Yet the facility emits none of the noxious odors I associate with petrochemical plants. To satisfy my curiosity, last week I stopped by what is actually the Phoenix Feeds & Nutrition mill. I had no appointment, but Dave Santos, Phoenix's co-owner, president and general manager, was kind enough to give me the "five-cent tour." I got more than my money's worth. Who knew that many of Vermont's dairy cows are noshing on high-carb feed made from doughnuts, Twix bars and leftover Christmas candies? Or that the mill is powered mostly by renewable energy? More on that later. Santos, 52, is a Tulare, Calif., native who grew up in the San Joaquin Valley and has spent most of his professional life in animal nutrition. He founded Phoenix in 2004 with co-owner Craig Newton; today it produces feed for dairy cows, poultry and hogs. Santos and Newton opened this particular mill in 2006 in a former Omya calcium carbonate plant (closed since 1992). Phoenix relies heavily on the adjacent railroad for about half of its deliveries of soy, corn, canola and other grains. Santos handed me a hard hat, then led me inside a building that houses Phoenix's new 150-foot grain elevator. Before it went up earlier this year, the company's tallest was 90 feet. Why, I asked, are grain elevators built so tall? And what do all those pipes do? As Santos explained, this mill consists of 18 grain bins holding 100 tons apiece. The pipes contain augers and conveyor belts that carry grain to and from the bins. The elevators are so tall, he said, to help the grain flow better. Plus, as with an apartment building, vertical storage takes up less space on the ground. Like most nonfarmers, I had no idea of the extent of science and technology involved in producing animal feed. Inside, we passed scores of pallets of bagged minerals, vitamins, amino acids and other ingredients. If grains are the "macros," Santos explained, minerals and such are the "micros." Each of 52 micro bins had a different label: "Mold Zap," "Biotin," "Vitamin B-20." Animal nutritionists select each micro-ingredient to formulate a feed batch that complements the animals' normal forage. "Everything we do is custom," Santos said. "It's all about making a pound of milk for the least possible cost for profitability, so these [farmers] can survive." Phoenix itself isn't just surviving but thriving. It started with just three employees and now employs 45, Santos said, and is growing by 8 percent annually. The timing of my visit was fortuitous, as Phoenix is currently upgrading to a totally automated system. Inside a control room, computer screens displayed the portion of each ingredient by weight — two tons of canola, a few pounds of urea, a splash of lime, a dash of salt. The components are blended, then loaded into delivery trucks. Inside an adjacent building, a front loader zipped back and forth, dumping grain into a hopper. This is the old system Phoenix is phasing out, Santos said, but it's not exactly low-tech. As the loader passed, I noticed an iPad mounted on the dashboard. Santos said the driver can control the entire plant from his seat. From there, we walked across a dirt lot and into an old warehouse that had the sweet aroma of a bakery. I quickly learned why: Before us was a pile of partially shredded boxes of Tastykake doughnuts and cupcakes. Many hadn't even reached their sell-by dates yet. As Santos explained, Phoenix buys baked goods that would otherwise be tossed away owing to manufacturing errors. A turbo separator removes the packaging, which gets baled and recycled. The remaining high-sugar-and-carb meal gets blended into feed mixes. "This is about 1,200 to 1,500 tons a month that would go to a landfill," Santos noted. We passed several stalls, each with its own pleasant smell. One held shredded cornmeal and bread; another, a brownish-white pile about the size of a Volkswagen Beetle. "Can you guess what's in it?" Santos asked. I scooped a handful and sniffed it. "Cookies?" I guessed. Actually, it was chocolate-chip cookies, animal crackers and Twix bars, shipped from Hershey, Penn. The next bin held dyed-red meal. After Easter and Christmas, Santos said, tons of unsold candy would be discarded if Phoenix didn't buy the holiday treats. The next bin was yellow tinged. "Doritos?" I asked. "No. Distiller grains," Santos replied. "We're just trying to be sustainable. It's a tough industry and a shrinking industry. We have less farms every year in Vermont ... so there are fewer farms for us to call on." With a dozen or so other feed companies in Vermont, Phoenix does what it can to remain competitive. To that end, the company recently applied for a permit to build a five-acre solar array on-site. When the town rejected the application, Phoenix built an array in Bennington instead. Since going online in March, it has generated more than 70 percent of the electricity the company uses. That's not exactly chicken feed.